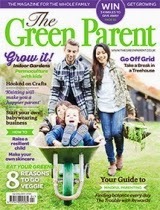 If you want to read a really great uplifting, good value magazine for parents, I don't think you can beat the Green Parent. It's bimonthly, available by subscription and in major chains such as Sainsbury and WHSmith. I'm really pleased to have an article featured in the current issue - pages 40 to 42 and am looking forward to reading the rest of the great contributions, craft ideas and product reviews. I like being able to treat myself to a magazine that I can read from cover to cover that's not just endless pages of sick-looking models pushing expensive buggies and exhorting me to spend £80 on a changing bag.